If you’re a ‘making your own’ newbie and you’re looking for a simple but useful sewing project, then making your own curtains is the way to go. Curtains prove not only handy in obscuring views and blocking out light, but also actually make practical draft excluders. Curtains can also become a focal point of any interior design scheme - bold prints, sumptuous materials and an excess of length always make a bold and daring statement. So to get you started, here’s a quick and easy way to make your very own simple, unlined curtains. You should note that the curtains described in this article use curtain hooks, and so aren’t suitable for curtain holes. For this you’ll need to create tab top or eyelet headings. Firstly, you’ll need to measure your window. Each curtain that you make will need to be one and a half times the width of the window. This means that the total amount of fabric you use then totals over three times the width of your window. You’ll also need to make sure that the fabric you choose is long enough to cover the window. Make sure that you also add at least 10cm to allow for the heading and hem. Once you’ve measured the fabric, you’ll need to take one vertical side of your curtain (the side that hangs ceiling to floor) and fold it inwards about 2.5cm. You can either tack the fabric in place, or press it flat with an iron to create a crease. 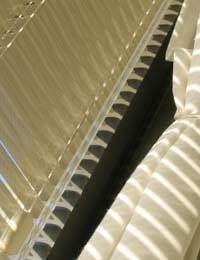 Repeat this step with the remaining raw vertical edge on the other side of the curtain. The next step is to add the heading tape. Ready-made heading tape has small pockets for curtain eyes to feed through, and incorporates gathering cords. When the cords are pulled, the header tape gathers the fabric into pencil pleats. You can machine sew the heading tape over the top raw edge of the fabric, which saves time on creating a hem that won’t be seen anyway. On the final raw edge, you’ll need to create a hem. It’s vital that you make sure that the hem is straight, especially since you’ll be pressing the hem to create a strong crease. Once you’ve achieved a straight hem line, on the raw edge that has been turned up, again turn the raw edge downwards to fold inside the hem on the back of the curtain. This can then be secured by machine sewing into place. Once you’ve sewed all the raw edges, you’ll need to press the curtain with an iron. Then take the curtain hooks and space out evenly along the heading tape. Once the curtain hooks are in place, you can begin gathering the curtain. Gathering is how you achieve the aforementioned pencil pleats at the top of the curtain. Simply pull the gather cords evenly – depending on the style of ready-made heading tape, you can have up to 4 gathering cords to pull at once – and gather the material evenly throughout the heading tape. This can take a fair amount of time and adjustment, but is, in itself, an easy job to do.